The EXTRICATOR® RS-1 is a compact lightweight basic rescue set that stores easily, and provides the basic tools for needed emergency extrication work. It is ideal for police cars and similar vehicles where powerful rescue tools must be accommodated in a small space. The set includes two rams – the powerful “Wedge” with a 3/8" closed tips opening to 4" and a 5¼ inch stroke 5 ton Straight Ram, 10,000 P.S.I. pump. Both the Straight Ram and the Wedge are provided with heavy duty screw type dust caps to keep dirt out of the hydraulic couplings when a tool is disconnected from the pump and hose assembly.. Spreader toes and other attachments provide additional lifting and spreading capability up to 28”. 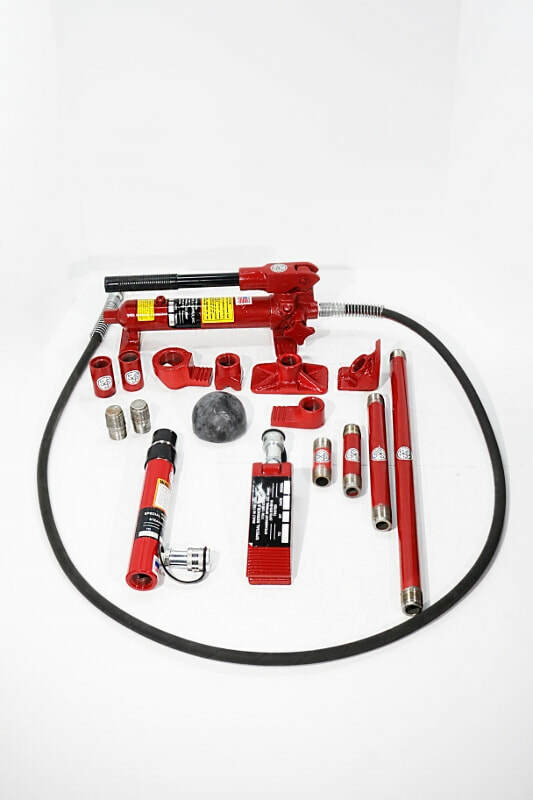 The set includes a rubber flex head, serrated saddle, wedge head, flat base plate, ram cylinder toe and ram plunger toe attachments along with two short male couplings, 3”, 5”, 10” and 23” ram extension tubing sections and two female connectors are used in conjunction with the ram attachments for lifting, pushing, spreading and bracing operations. The ram extension tubes have been improved with knurled surfaces to provide better grip in wet conditions or while wearing gloves. 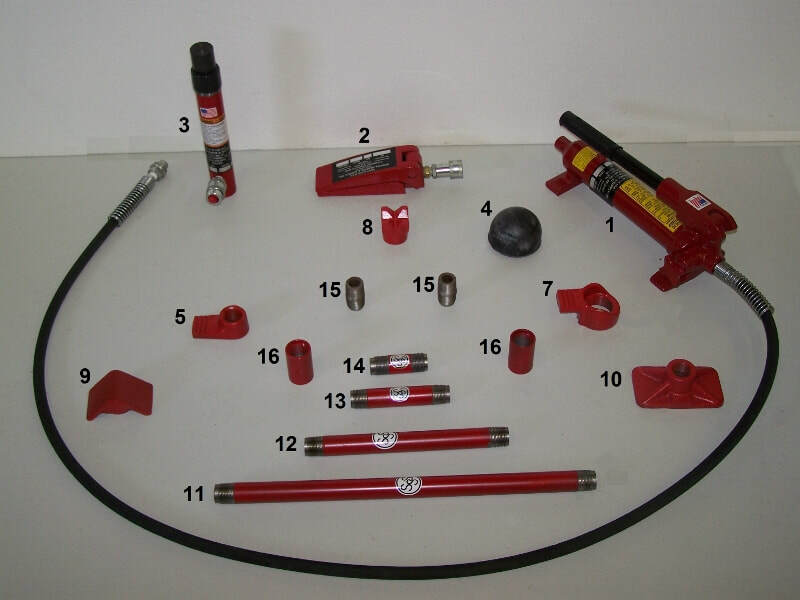 This is a basic extrication set at a budget saving price that is worth many times its cost on critical emergency calls. All EXTRICATOR® RS-1 5 Ton Rescue Sets were recently upgraded to increase their capacity. The upgrades include the completely redesigned straight 5 ton hydraulic ram cylinder, improved with 2,000 pounds additional capacity, high flow hydraulic fittings, dust caps on the hydraulic fittings, a precision wound steel spring which provides fast and complete retraction even with the cylinder in a horizontal position, precision machined and burnished cylinder bore to extend seal life and improve spring retraction rates, high quality specially designed seals are used to provide long life and optimum performance. The heavy duty piston retaining ring prevents blowout and eliminates deformation, new heavy duty bearings are designed to resist side load problems and prevent galling. The ram cylinder has an unprecedented lifetime warranty against material and workmanship defect. The all new, H2S steel pump’s design incorporates reliability for tough rescue applications with new features including vertical or horizontal operation, compact size, and increased fluid reservoir capacity, up to three times faster operation, to provide years of reliability with ease of operation. The new high flow design of the H2S pump incorporates a larger hydraulic piston and increased hydraulic reservoir capacity to reduce handle strokes, providing more rapid tool operation. The fill port has been relocated to the top of the reservoir under the pump handle for easy access and filling. The H2S pump is equipped with an internal pressure relief valve providing overload protection, complying with ANSI/ASM B30.1 Safety Standards. This new pump also incorporates a new larger fluid control valve designed for easy operation while wearing gloves. A heavy duty pump handle with ergonomic grip has also been integrated into this new design. Shipping weight 32 lbs. Ships via FedEx Ground ®.